Richmond is full of rich history and architecture to explore. 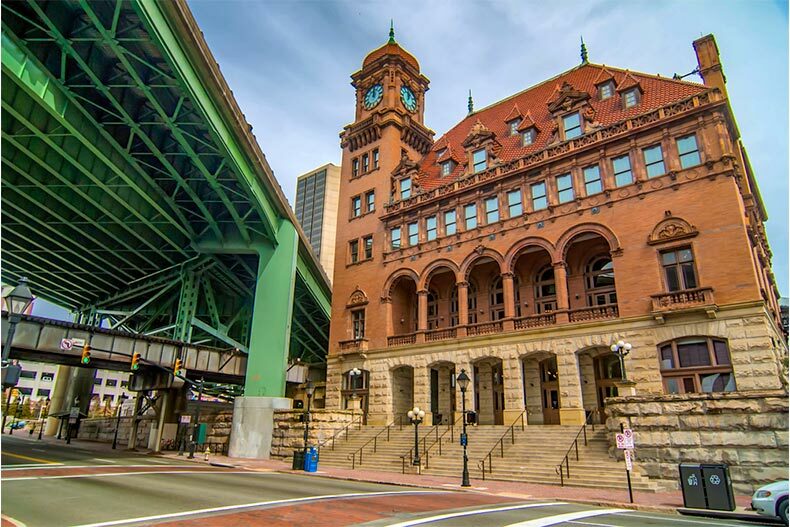 Located in the middle of the state, Virginia’s capital Richmond is a place people will often just drive through on their way along Interstate 95. But the growing city and the area in Central Virginia has a lot to offer. Visit museums that explore the history of the capital, get outside in the parks and gardens and experience the culture and arts the city has to offer. Richmond is probably most well-known as the capital of the Confederacy, and the American Civil War Museum strives to explore the Civil War in its entirety, telling the stories of soldiers, civilians, free and enslaved African Americans, and the Union and Confederacy. The Virginia State Capitol building, one of the oldest in the country, is also open to visitors and features rotating exhibits on Virginia history. Guided tours are also available. Richmond is centered around the James River, and guided boat tours tell the history of the city with spectacular views. Both in and around Richmond, being outdoors offers you opportunities for experiencing the beauty of the region and being active. The James River Park System is an expansive area that includes green space on both sides of the river near the center of the city. One of the highlights is Belle Isle, with wooded trails for hiking, walking, and biking. Not far from the park is the Maymont Mansion, a gilded age estate that has been turned into a museum. The grounds and garden are free, with beautiful views of the river. The Lewis Ginter Botanical Gardens offers 40 acres of green space and a conservatory with rotating exhibits. The Byrd Theater is a gem in Richmond that takes moviegoers back in time and doesn’t break the bank. The historic movie theater shows classic and recently-released films 365 days a year, and tickets are only $4. The art and theater departments at Virginia Commonwealth University (VCU) also offer inexpensive ways to appreciate art. Performances and gallery exhibits present student work throughout the year, while the University hosts over 200 concerts of guest musicians and performers on campus. People living in the Richmond area can also create their own art through classes at the Visual Arts Center of Richmond. Richmond is metropolitan, but remains relatively inexpensive, and is a good choice for active adults. Here are a few communities in the area. The Villas at Archer Springs is a small community of only 95 homes. The single-family homes are newly built and include two or three bedrooms and range from 1,500 and 2,200 square feet. The low-maintenance living includes lawn services, and each house has a two-car garage. While the community doesn’t have a clubhouse, easy access to Richmond and the parks and green spaces right outside the community make it ideal for active adults. Settler’s Ridge on the south-east side of Richmond offers newly-built and resale. The homes range from 1,200 to 2,000 square feet, and from two- to three-bedroom, all with two-car garages. The community is centered around a clubhouse, and also has a heated indoor pool, exercise room, community room, and ballroom. The Villages at The Crossings is conveniently located in Glen Allen on the north side of Richmond with easy access to Interstate 95, getting into and out of Richmond is easy. The low-maintenance attached homes are both single-level and two-story, with an attached garage. While the community of 165 homes is split into two sub-developments, they share the same amenities. Residents can enjoy the outdoor pool, patio area, clubhouse, exercise, and nearby walking trails.